Every year, I rush to complete my cosplays for Salt Lake Comic Con, and with that rush always surmounts a heap of stress. After throwing Red Sleeves’ OK on my sound system, however, my stress levels were swiped by their lively indie pop-rock. Mixing great basslines, danceable drums and innocent lyrics with polished electronics, Red Sleeves are a band that makes you feel good instantly. 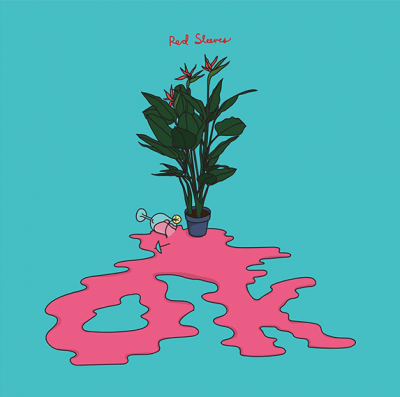 Starting off the album is “I’m Ok,” with lyrics that proclaim that they “only write these songs to make you smile.” Red Sleeves brings their listeners back to the early and mid-2000s—and for me, that means to high school and high-school sweethearts. Lyrics that inspire laid-back confidence, such as “we’re okay—I made mistakes, but that’s okay, who hasn’t?” and cheesy-but-cute lyrics like “You’re everything that I wanted to kill me / You don’t even know, but that’s just how it goes” combine to create the perfect blend of lovestruck and happy-go-lucky moods. I found myself humming the tunes of the album all week, smiling as I’d get to the song’s delightful chorus. If there were ever a theme song created for eating ice cream in 80-degree weather on a first date, it would be “Brainstorm.” “Brainstorm” has that fun blend of Motion City Soundtrack with twenty øne piløts, complete with cute lyrics and an upbeat dance background. But my favorite song is “Thursday,” a song that is impossible not to dance to and play on repeat over and over again. With a fast drumline, solid harmonies and Metro Station–like electronics, Red Sleeves had me singing the lyrics “I’m terrified, terrified, of everything falling apart / I must have been electrified—this one has my heart / I’m far away from here / I’m far away from everything.” The guitar in this song is my favorite, creating a California vibe that contrasts well with the song’s danceable quality.